Kerala Plus Two Time Table 2019 PDF – Directorate of Kerala Education Board (DHSE) has released Kerala Plus Two (+2) First and Second Year Examination 2019 Date Sheet. 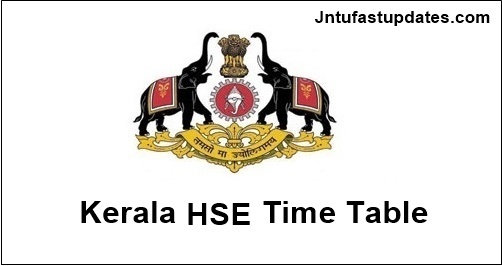 Students can download HSE Time Table 2019 on the official website of the DHSE Kerala – dhsekerala.gov.in. Candidates who have registered for the Higher Secondary Examination March, 2019 they can download HSE Time table from official website. The Kerala Higher Secondary Education board has released the Kerala HSE time table 2019 on 20th November. After the official announcement, the students can download their DHSE Kerala Plus Two (+2) time table from the official site dhsekerala.gov.in. Based on the Kerala Board HSE time table 2019, the students have to appear in the exam without any fail. Kerala DHSE class 11 and Class 12 examinations will begin on March 6 and the exams will be concluded on March 27. The students can know whether they should be presented in the morning session or afternoon session in the exam. The exam timing will be 10.00 AM to 12.45 PM (For Subjects without Practical’s) & 10.00 AM to 12.15 PM. The students can know their exam dates from the exam time table. Name of the exam board, Name of the exam, name of the subject, date of the exam and session of the exam will be given in the Kerala HSE Plus One and two time table 2019. All the candidates who will appear for the exam can download the Kerala HSE time table 2019 from here as soon as published by the board. Moreover, approximately lakhs candidates will take the examination this year. Last year, The Kerala DHSE had released the Kerala Plus Two (Class 12th results) on 10 May. Out of the 3.69 lakh who appeared for the exam, a total of 3.09 lakh became eligible for higher studies. The pass percentage for the Plus Two exam stood to 83.75 percent. The private and regular students can check and download time tables of Kerala HSE 1st and 2nd year all stream such as Art, commerce and science from official website. HSE will conduct examinations of Biology, Electronics, History, Geography, Mathematics, Political Science, Basic Maths, Economics, Geology, Psychology, Physics, Logic, Education, Optional Kannada, Statistics, Home Sciences, Business Studies, Chemistry, Marathi, Urdu, Sanskrit, French, Hindi, Telugu, Sociology, Accountancy, English, Malayalam and Arabic. NB: The Practical Evaluation will be conducted from 14/02/2019 to 01/03/2019. How to Download Kerala Plus Two (+2) Time Table 2019 PDF Online? Go to official website “www.dhsekerala.gov.in”. Then, click on “HSE Date Sheet” link. Take a print out of the date sheet and save it for further use. The Directorate of Higher Secondary Education provides the candidates the opportunity to get their answer scripts re-valued and scrutinized for those papers without double valuation. Photocopies of the valued answer scripts are also issued on request. This facility is available for all the examinations conducted by the Directorate. The Directorate is envisaged as a central agency of the state government seeking to promote all round development in higher secondary education by establishing appropriate philosophies, adequate institutional network, effective administrative systems and well-qualified and motivated staff necessary to carryout academic and administrative responsibilities.Kerala Plus Two Exam Time Table 2019 released by the Kerala Board of Higher Secondary Education (KBHSE). 1.3 How to Download Kerala Plus Two (+2) Time Table 2019 PDF Online? Plz give time 4 physics……………..
Sir plz give more time for physics @ chemistry. I am studing in 12th.I want to know our correct time table. When the exam will start and when it will stop. Is there any leave b/w exams. can we get time to study. When will it start in the morning or afternoon. Sir plz give more time to humanities reply. …..